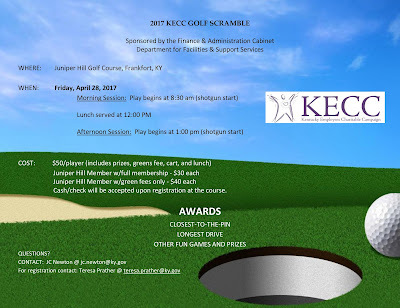 Finance KECC Golf Scramble: Join us on April 28! Finance and Administration will be hosting their 2017 KECC Golf Scramble on Friday, April 28! Two sessions are available, so so sign up today before your preferred spot fills up! The scramble is at Juniper Hill Golf Course in Frankfort, KY. The morning session begins at 8:30am, and the afternoon session at 1pm, both are shotgun starts. Lunch will be served at noon. $50 per golfer and includes prizes, greens fee, cart, and lunch! Prizes will be awarded! If you have questions, please contact JC Newton: jc.newton@ky.gov.